Our country must be built upon a justice and charity in which our individual rights and privileges are conditioned by the service of the common good. The dominating influence of Capitalism and Communism over modern societies has eclipsed the Catholic Church s communication of her social and economic principles. 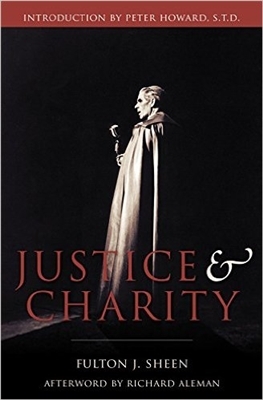 Campaigns to win the affections of the faithful have persuaded many that Capitalism with its promise of unlimited freedom and praise for the accumulation of wealth is an authentic expression of Catholic social teaching and that the richness of the social tradition with its preferential option for the poor is driven by class-hatred, envy, and egalitarianism. Grounded in his expertise of the social doctrine of the Catholic Church, in Justice and Charity, Fulton J. Sheen explores how Capitalism s failure to submit to justice and Communism s rejection of Christian Charity can be corrected only by a revolution in the heart of men by means of encountering Jesus Christ. Back in print for the first time since its original publication. Dimensions: 5.5" x 0.5" x 8"